The site has been up and running now for a month and we are all very happy with it. It met all our criteria. It looks great, is accessible, easy to control and easy to update. What I really liked was your responsiveness and the way you understood the company’s character and helped get the site to reflect that. No mean feat given we were three time zones and four thousand miles away. Many thanks, once again. Stuart McGhie. Newport Africa were an Africa focused business providing specialised risk mitigation services for private and public enterprises operating in difficult environments. Newport Africa managed assignments on land and sea throughout the region and particularly in areas of potential significant civil instability. This is a business to business – B2B, environment and the website is to promote brand awareness for new and existing customers. A reference site and resource hub for existing clients but also attract new clients who have not heard of Newport Africa. An information portal detailing security issues in the region. 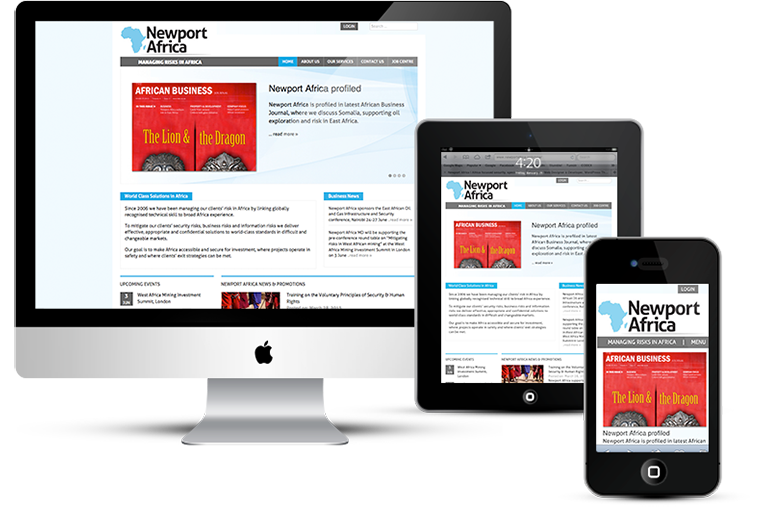 The web design is very professional and portrays Newport Africa as a secure choice. The website provides a lot more information and is dynamic with active news and content feeds refreshing regularly. It is engaging and involving, providing a service to new and existing clients. Above all the site presents Newport Africa as a forward thinking market leader in their field. Twitter feeds work very well in B2B markets and video engage the visitors further. A custom build on WordPress means advanced content management, with bespoke areas for image uploads and content within the WordPress admin. This makes it even easier than usual for the clients to be able to update their website and keep the content current.